Samsung Galaxy S III model design revealed, although Samsung officially do not confirm about it. But now the design, according to the Galaxy S III photo, the new set will be slimmer and smooth design which gives it a more stylish look. Samsung yet not set the Samsung Galaxy S III release date yet. But according to this photo, where it says, it will be hit in the market on next May 22, in London, UK. The image of Samsung Galaxy S III firstly appears in some Korean news portal before USA sites cover this news. Yahoo Korea, NavInside, FooHoo (Tistory personal page) are some of them. It is real or not; what do you think? 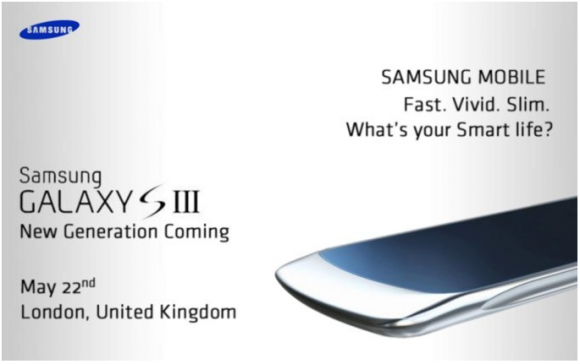 Whether it is, but we believe that Samsung’s upcoming Galaxy S III will be more stylish and gorgeous than Galaxy S II. Stay with us, will give you more review of this.